The Prius is more practical than the Corolla sedan and styling is another. Both have mediocre power but high mileage but I would choose practicality over styling as long as it wasnt ridiculous like the pre-refresh Prius. Noe of the Prius generations, since its American-market 2000 introduction, have been anywhere near what I'd call good-looking, and the material-solidness seemed to noticeably thin out and get much lighter with the 3Gen model. But there is no denying the fuel-economy in these cars....they are not the darlings of the environmentalists for nothing. Lately, though, the Kia Niro and Hyundai Ioniq have offered a serious alternative.....and they are far more conventiontally-styled inside and out, with less-quirky controls and displays. The new Honda insight may be the best looking hybrid and one with the fewest compromises. Acceleration is actually pretty good with 0-60 times just over 7.5 sec and the fuel mileage is still pretty good at 55 city/49 highway. The overall mileage is 52 mpg. The LX price is about $23,000 which is cheaper than the base Prius. Where do ever get good power and high mileage? I would call the 2.0L Hybrid in the UX has pretty good power and high mileage. Also, what about all those small turbocharged 4cyl engines that has good power and relatively high mileage? Yea styling is all subjective and personal preferences and all that. WHile the KIA and Hyundai does offer serious competition, over the long term, I would still choose the Prius due to long term reliable. These things can't be cheap to fix with all the tech that is in them. Both are four-door compact sedans. Prius has the lift-hatch, is that what you are referring to as far as practicality? Beyond that, I now see little setting them apart other than the freak-show styling of the pre-refresh Prius. Yea I see the Prius as more of a hatchback than a sedan. Trying fitting a grill from Home Depot into either car, or any bulky object for that matter and it will make a huge difference. Slight departure here, but I really like the 2020 Corolla Wagon, which of course, we won't get it in the US because Americans hate wagons and would rather drive high cars with big tires. Last edited by link13; 02-12-19 at 11:49 AM. Slight departure here, but I really like the 2020 Corolla Wagon, which of course, we won't get it in the US, because Americans hate wagons and would rather drive high cars with big tires. Very attractive car IMO. I would like Toyota to offer it. no, it's because americans don't drive on medieval roads and a million people to an acre with no parking. americans have space and they value it. europeans (well the peasants, anyway ) don't, and so have to drive shoe boxes. cute car for a teenage girl, beyond that.. meh. It's a nice car for anyone who likes Corollas. While I'm not saying that stereotypes have no truth to them, I generally don't agree with them. no wait, this one is better suited. omg. Nice. Don't make fun of my car. It's quite satisfying. Anyways, here is what I found in the new Corolla manual. 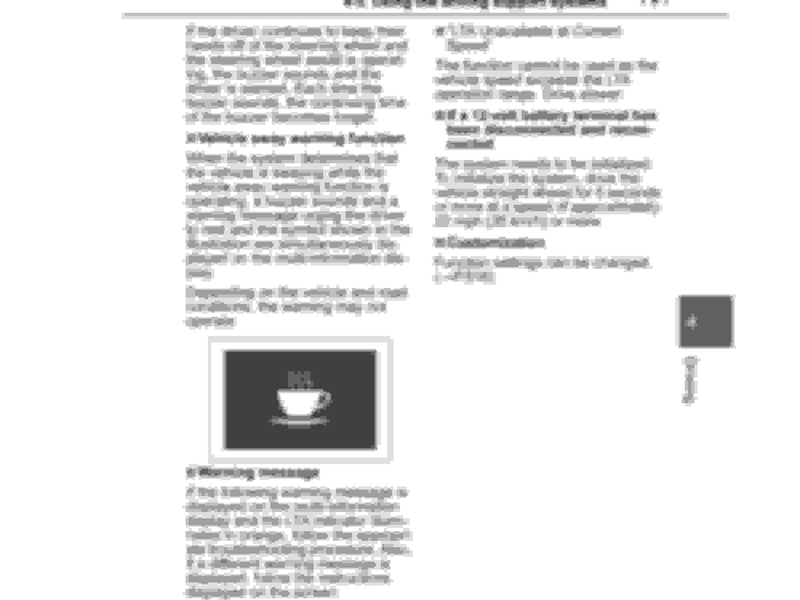 It's has a coffee cup sway warning. Exactly. The Corolla may be a little small for my tastes, but I'd buy one before a number of other vehicles on the market. For one, it probably sets the standard for its class (low-priced compact sedans) in refinement. And, of course, its reliaibility record is enviable. The Buick Verano was quieter and plusher, but was not really in the same class....it was slightly more upmarket (and it is now gone from the American market).